I love how competition delivers better, often free, services for the consumer and the Toolbar Wars are no different. With the three way tug of war between Microsoft, Google and Yahoo (4? AOL) for toolbar space on your computer the functionality is just getting better and better. As I'm not a stock holder in either company, so I'm all for non profit making giving away the company, services. The tool bar is available here http://ideas.live.com/toolbar Then you can choose which of the options to download. "Onfolio is the complete solution for collecting,organizing and sharing online content. Built into the browser, Onfolio is a convenient and familiar tool that will make your web research more efficient and organized." Basically you can copy visuals/text/photos/feeds etc from the web, think of it as a scrap book for your browser. It's a great tool and whilst I'm a huge fan of Microsoft Onenote which is similar (though paid for) everyone should be using Onfolio. Two Thumbs Up. 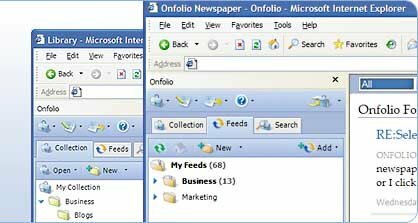 Todays file-management interfaces are more or less the same for the last 10 years. Ok we have thumbnail-previews in our icons to reflect the actual file-contents, but it is still only a stand-in or substitution for the real thing. But it's not very real-world-like, where you have e.g. a bunch of photos or document-sheets that you just can look at to see what's in them. It's not really a seamless experience. On the other hand there are desktop search-tools like beagle and Spotlight, which help us find the kind of things we are currently interested in from our huge heaps of personal data. Thus we don't see the unhandy clutter of hierarchical file-systems. Would it not be great if the computer could show us just the stuff we currently interested in, in a natural fashion where there's only our documents and hardly any UI at all? Enter 'lowfat'. Its goal is to bring that life-like and natural display to the desktop, alongside with a flat hierarchy of our files, when combined with todays search-engines. The aim of lowfat is to be an engine to view and handle your documents with lifebehaviorhaviour allowing for example to seamless zoom, pan and rotate them. Furthermore it should support the user by making sorting and arrangement - according to certain criteria - of the currently viewed documents available. Current (and even not so current) hardware is capable enough to allow these kind of things. Common graphics-hardware and CPUs are mostly idle during general desktop-usage, when you are looking through your files in your file-manager. This processing-power can be put to good use by 'lowfat'. Which got me thinking, how long do we have to wait for some decent "revolutionary ideas" in UI compared to just evolutionary plodding in the last few years. Lets face it, how far have we really come from the days of windows 3.1? I mean I know Vista is a big project, I know that it takes a lot of time and energy (and money - but Bill, once you get to $50B it's hardly a competition anymore) to develop a new operating system and it looks like MS is only going to be developing these every 4-5 years but realistically when was the last time you saw some type of information presentation that you thought "neat" that's something I can use. but to be honest without the UI developments this hardware will never be developed. I know for me I would love to have my monitor built into my desk. A great big 80cm touch screen (under glass so when I spill my coffee I dont jump out the window). 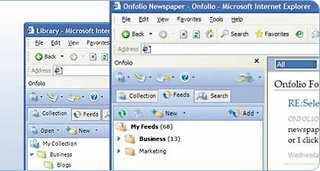 Being able to interface via touch will add new dimensions to multi-file control.....some companies will get it and develop the interfaces to deliver, some wont (I'm talking to you Mr Benioff at salesforce.com with your crappy document manager tab). If you could change the way you work with your computer what would you want to see? Is it voice, is it manual interface, is it a two handed single plane mouse, is it multi-input touch screen? Deleting Files is a Crime? "A former employee of International Airport Centers, who is currently embroiled in a legal dispute with them, returned his company laptop as required. Hoping to find incriminating evidence, I.A.C. attempted to retrieve deleted information from the laptop in question with no success. This employee had beaten them to the punch. He had used 'secure delete' software, in order to make sure nothing could be recovered. He is now being charged with a violation of the Computer Fraud and Abuse Act." Jacob Citrin was once employed by International Airport Centers and given a laptop to use in his company's real estate related business. The work consisted of identifying "potential acquisition targets." At some point, Citrin quit IAC and decided to continue in the same business for himself, a choice that IAC claims violated his employment contract. Normally that would have been a routine business dispute. But the twist came when Citrin dutifully returned his work laptop--and IAC tried to undelete files on it to prove he did something wrong. IAC couldn't. It turned out that (again according to IAC) Citrin had used a "secure delete" program to make sure that the files were not just deleted, but overwritten and unrecoverable. Hmmm, note to all - if you consult, dont sign the proforma employment contract without considering all of the terms and dont accept anything on face value (especially the IP Ownership term that everyone seems to want to put into my contract about owning the rights to any and all IP that I develop during the course of employment....yeh right, start paying me for 168 hours a billable week and we may negotiate a percentage but until then dont even kid yourself that you own my concept development 24 hours a day). You could do worse in life than by living your life from the sayings you get in Bacci chocolates. Jodie found one today that I truly felt warranted being posted here. "The Heart Has Its Reasons Which Reason Does Not Always Know"
I always hoped Australia would go down this path but looks like the GST has stalled into an 'additional' tax rather than an income tax offset. Either way I'm sure some country will go down this path, when you think about it most of the 'tax havens' already have a quasi gst in effect requiring you to live (and in effect spend money) for between 60-120 days a year, this 'residency' requirement often supports the local community through employment and support year round of these part time residences. It’s basically a screenshare application for skype users. While you are on a chat you can share docs, web browsing, image viewing etc. It's still a little bit beta'ish' but works pretty well and its free for 1 on 1 sharing (paid version allows up to 4 people to view apps). Let me know your thoughts I’m curious to see how well it operates once the number of users picks up.